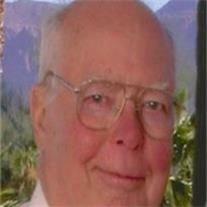 Duane Arlen Hansen left this earth for his heavenly home on July 5, 2012. He passed away at home surrounded by family. Duane was born August 19, 1936 to Chris and Evelyn Hansen in Yankton, South Dakota. In 1953 he met and married the love of his life, Verna Thornton. She survives along with 4 daughters: Karen Kokemoor of Snook, Texas; Cynthia (Brad) Currey of Peoria, Arizona; Roxanne (Cyler) Groseth of Surprise, Arizona; Joy of the Home (Matt) Hansen of Lincoln, Nebraska; eleven grandchildren and seven great-grandchildren. He was proud of his daughters and was very involved in his grandchildren’s lives until his death. He is also survived by a sister, Carole (Charles) Miller of Champaign, Illinois; sister-in-law Marie Thornton of Spearfish, South Dakota; seven nieces and seven nephews. He was preceded in death by his parents and a daughter, Renae (Charles) Frick of Pickstown, South Dakota. As a teenager he had an avid love for horses. To the dismay of his parents, he broke and tamed wild horses and rode broncos in rodeos. Duane graduated from the University of South Dakota and worked for 35 years as an Analytical Chemist for the State of South Dakota. After retiring from that position, he served as the Executive Director of the Yankton Senior Center for three years. Duane was an avid outdoorsman and loved hunting, fishing, boating and playing golf. He also had a love of music and played the 4-pedal steel guitar for many years. After retirement, Duane began spending winters in Arizona, and soon Apache Junction, Arizona, became a permanent location. He met the challenges of illness with the same extraordinary faith, grace, sense of humor, and patience that marked his life as a husband, father, brother, uncle and friend. He was always capable of finding the humor in any situation and was loved by all who knew him. A memorial service for Duane will be held Saturday, July 14, 2012 at 1 PM at 400 North plaza Drive, Lost Dutchman Resort, Apache Junction, Arizona.